Kawasaki has taken quite a while replacing their old trusty workhorse and beginners bike the ER5. So I expected them to come up with something that could maybe knock Yamaha’s FZ6 off its pedestal. In terms of modern design and technique it’s a big leap ahead from the ER5, but is it a good bike? My absolute first thought was that the handlebars are very narrow. But otherwise it was quite comfy – everything sitting where you would expect. Heading off, I found no issues with the brakes and suspension. You have to get a bike under your skin before you can really start to test the brakes. But for a beginner’s bike, I’m sure they are more than capable. The Kawasaki ER6n feels very light and with its 174 kg it is also 20 kg lighter than what I’m used to. Which would be just fine, but my impression was that the weight combined with the narrow handlebars made it very wind sensitive. It was a bit windy that day, and once when I overtook a car and gave the throttle an extra notch, it didn’t feel comfortable at all. No doubt the engine would like to play, but the steering was holding back on the fun. I certainly didn’t experience that on the FZ6. Looks wise I think the bike is pretty sharp. Rear suspension spring tugged in asymmetrical on the right hand side, Buell style exhausts hiding beneath the engine, not your average square swing arm. There are a lot of nice details on the bike, except for the headlight and gauge area that looks like they forgot to give it gauges and had to come up with a quick fix. I wonder if you can pick up Zeta Rocks on the clock radio Kawasaki put on top of that fly screen. Seems the good old classic round motorcycle headlight is seriously going out of style. I’m going to be nice and give it three helmets, because of the long awaited design update and the side by side twin engine. It’s not Kawasaki’s fault that they don’t know round headlights and wide handlebars is the coolest thing next to the Tesla Coil. For a beginner’s bike, it’s not a bad choice at all. 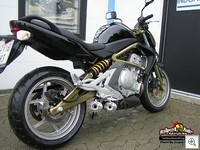 I DRIVE A ER6N 1 MONTH .FOR ME IS 18 MOTORBIKE TO HAVE .IS A VERY STABILITY MOTO WITH GOOD BRAKES (I NEED 2 TIMES). IS SOMETHING LIKE BICYCLE WITH 70HP AND I LIKE THIS. I see what you mean, a bicycle with 70hp. That was a bit scary to me. But no question its a good bike. I prefer motorcycles that are a bit more directional, and need to be leaned into a curve rather than steered in. I’ve learned to ride a bike, with ER-6n, it’s really great, i drove normally within 2 days!! I’m seeing more and more ER6n on the street, and it’s no wonder if you compare it to other bikes in the same category. Like the CB500 or the GS500E, that should have been updated years ago. Having researched for months amongst SVs, CBFs, FZ6s. 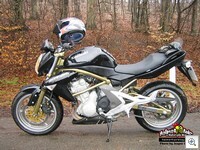 What can I say; the ER-6N is the perfect bike for newbies like me. It feels so stable I almost forget to put a foot down when I come to a stop. All the controls are tame and compliant. It’s a 650 that feels like a 400, which is fantastic. For a bike priced at basic commuter prices, you can’t put your money on a safer bet. If like me you are nervous about the first step to bigger bikes, it doesn’t get easier than this! As for build quality, looks good, I’ll let you know how it stands up to the elements in a years time. Thanks for the input Mistersim, the ER-6N is a very good choice for a beginner or commuter bike. Enjoy your rides on the bike, and keep us posted on how you’re doing. Newbie biker riding an ER6n and have to say I’ve found it a joy to ride. Great for commuting and the weekend trip to the countryside. All controls very newbie friendly (positive neutral gearbox is a god send) and the balance of the bike feels solid at low speeds and when cornering. The one gotcha is those mirrors – I have fitted universal mirror wideners and would strongly recommend investing in them for your own safety. What are the ‘mirror wideners’ of which you speak? I am what most would class, an oldie but have had my share of bikes over the years. I have finally found the ER6n which has a seating position that doesen’t stuff your back or arms after 200km’s. The seating position is more like the old Trumpies of the sixties. If anyone wants more speed than the Er6n , I suggest they go to the race track. Anyone know what exhaust system was fitted to your test Kawasaki ER-6N as it is not the standard and what did you think of it?? PS I think it looks like a great bike and have just bought one. Yea, that’s right Christian. I couldn’t remember what the heck they where. Thanks for clearing that up for us. I am from macedonia and i have er6n about 2 weeks and its great, but its my first motorcycle.So I am haveing a bit of problem but I am getting it right so I dont rigret a bit. Sorry about my english. Good luck with the bike, Biljana, it’s a perfect start out bike. I’m sure you’ll have years of fun on that machine, when you get a hang of it. I have just bought an er6n it’s being delivered tomorrow,but it will stay in the garage untill this damn weather improves. Had a gilera runner before which was a nice fast scooter, hope this proves as good. Sounds nice Ginger, happy riding. 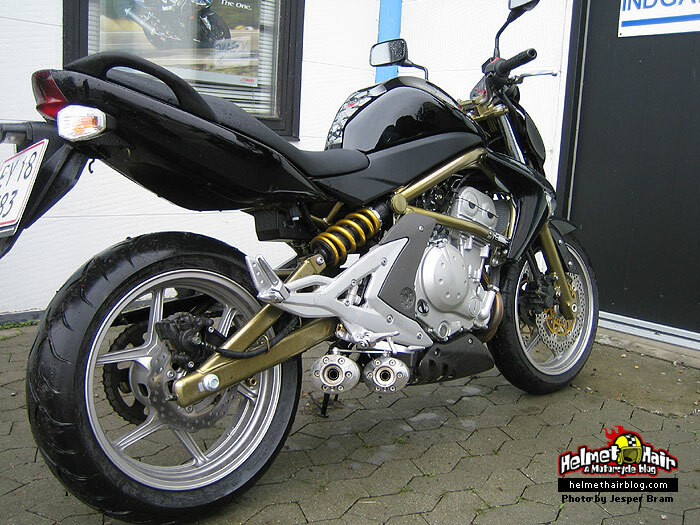 Anybody hav any negative comment about this ER-6n. I was thinking of changing my CB400 Spec2 to EN-6n.. Top Speed for ??? r if you guys have any suggestion for other exhaust ..
yeah george. i’ve had mine a bit over two years. my uncle was selling his after buying an s2r8oo so i took a demo out and rang him to say deal. it had 7000 km on the clock, a custom seat job (the std seat tends to make you sit on your nuts), an ermax hugger and chain guard and best of all a micron titanium can. sounds great and pulls a bit deeper into the rev range, still useful to run it through to ten and a half or so, where i found with the std pipe eight five or nine was all that was worth trying, that was a tight motor though. i put a dna filter in as well. mine has indicated 212 kmh which may not even be 200 in reality but for me it’s about the tight stuff in the ranges, which are plentiful here. holds it’s own in 99% of company. alot of riders here buy litre hyperbikes but, like me, lack the skill to let 150 hp out mid corner. with the er6n i have found i can go into a corner a bit soft and accelerate through it rather than needing the optimum entry speed, as increasing it mid corner on the big bikes is often suicide up here. it lets me get a look at what is in or just through the corner too, all too often a semi doing 10 kph or a tourist on the wrong side of the road saying “isn’t that a lovely view”. anyhow, enjoy the ride. Hey everyone, my names dan. “For a beginnerâ€™s bike, itâ€™s not a bad choice at all”. You seem to have placed this bike in a beginners box. Have you ever ridden it hard under controlled conditions, such as a race track? Not exactly sure what you mean, Robert. But what I mean is that it is a good bike for beginners compared to say a CBR1000 which I’d say is not a good starting point. I have not ridden the ER6n on a race track. But I imagine it would be fun, not my first choice for a race bike though. Amazing sound! 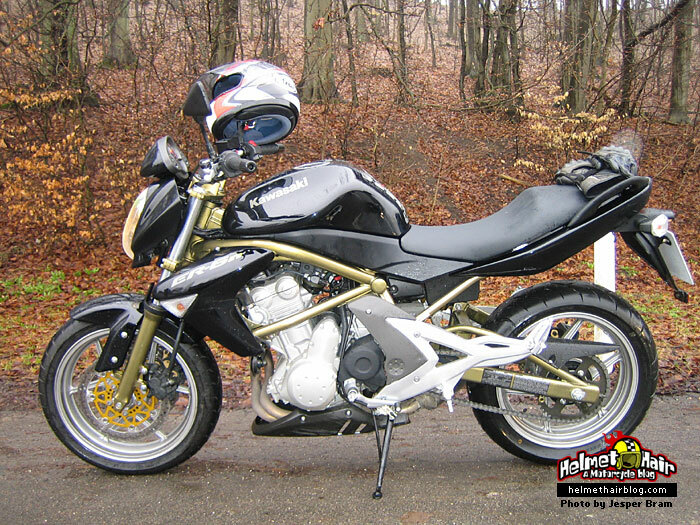 Can anyone identify the exhaust – I don’t think it is the one for the er6 from the Ixil website. Anyone who can tell me where I can buy it will move fairly high up my hero list. i am a newbie to the motorcycle community and am about to take a basic riders course. I plan on buying a bike in the next week or so and have been considering the er 6n. Is this bike to big or to much for someone to learn on? I have done much research and this seems like a good bike for begginers but i just want to make sure. thanks for the advice. While I own a 2009 ER-6F (Ninja 650) here in the U.S., not a 6N, I have to agree that the 6N and 6F are good beginner’s bikes, but they are a lot more than that. A whole lot more. These bikes will keep more experienced riders happy also. Let us not forget that while they are not built for high speed, they do have darn good acceleration and will give many bikes that are much bigger a run for their money in a 400 meter drag race. It will stay in the garage untill this damn weather improves. Had a gilera runner before which was a nice fast scooter, hope this proves as good. Wow, dude…you have a Ducati…wow, that makes you a real man!!!! jajajajaja….LMAO!. Aleksandar (Jan 14). Ducati Monster? Come on, get real! There are bikes out there that will eat that toy alive. Are you serious? Many a rider consider THAT to be a “Girl’s Bike,” whatever that means. Doesn’t it really boil down to what each individual wants? Why did the Almighty One Above choose you to be the person to decide what’s a “Real” bike? Too many riders go out and buy a powerful bike but NEVER learn to ride it to it’s full potential. Then, they look like fools when riders on less powerful bikes, but who have more experience and PROPER technique, whip their butts in the twisties/canyons every single time. “My car is better than yours.” “My house is bigger than yours.” “My computer is faster than yours.” “My bike is a REAL man’s bike.” Don’t we sound like little boys with a serious inferiority complex when we talk like that? I just returned to bikes after a 11 year break. I bought an ER6n just yesterday and have been mighty pleased with it with just a couple of exceptions. I find it is a little on the light side so you get blown around a bit in the wind or when you are passing large vehicles. Has anyone else found this? Also, the mirrors give me a great view of my shoulders and upper arms!!! (as mentioned by Rudy) I will be getting some replacement mirrors or risers/extenders very soon. Other than that, bags of power and torque for a little 650, nice low seat giving good low speed balance, the lights seem to be bright enough for me (answering Health’s question) after a country night ride. Of course this is only after one day and 180 k’s riding. My opinion could change over time but I see myself keeping it for a couple of years. @Sarah, take a motorcycle safety class, or a beginner track day. Just to get comfortable with the bike where there’s no traffic. It might cost you a bit of money, but it is very well spent. Yea, and where the whole package in safety gear. So you don’t have to worry about that either. I’ve had the bike now for 10 weeks and have done 1,800 klms. Would have been more except for the crappy weather (Melbourne). I’m still enjoying riding it. I still get that flutter of excitement as I put the gear on hit the starter. I mainly use it to get to work and back. Very good commuter and easily gets between the traffic at the lights in most cases. I have put mirror extenders on and it has improved rear vision quite a lot, but there is still room for improvement. That is really the only bad thing about the bike. Appreciating the dedication you put into your blog and detailed information you present. It’s good to come across a blog every once in a while that isn’t the same unwanted rehashed material. Fantastic read! I’ve saved your site and I’m including your RSS feeds to my Google account. Helmet Hair – Motorcycle Blog	Powered by WordPress 71 queries. 0.571 seconds.